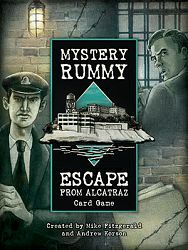 Escape from Alcatraz is an exciting Mystery Rummy card game by Mike Fitzgerald and Andrew Korson. Alcatraz Island is home to one of the most formidable federal prisons ever conceived. Though many men have tried, no one has ever successfully escaped from “the rock”. In this Mystery Rummy card game based on real prisoners and actual events, it is your job to foil escape attempts by gathering information on plans and capturing the ringleaders.